Roast pork, lentils and mixed Mediterranean salad is delightful. It is also easy to make and takes approximately 1 1/2 hours. To make your delicious roast pork, lentil and mixed Mediterranean salad you should first cook the pepper and aubergine under a medium heat grill. You can easily tell when they are cooked, as the skin begins to blister and turns a dark colour. Once they have reached this stage, remove the pepper and aubergine from under the grill and place inside a plastic bag, ensuring that you have firmly secured the end of the bag. Once secured inside, leave the pepper and aubergine aside for approximately 20 minutes. After this time has elapsed, open the plastic bag and remove the skin from both the aubergine and the pepper. The next step is to preheat your oven at gas mark 6 (200 degrees C), ready to place the potatoes and pork inside. You now need to take a saucepan and place the lentils inside. Next, ensuring that they are well covered, pour cold water over the lentils and bring the water to the boil. 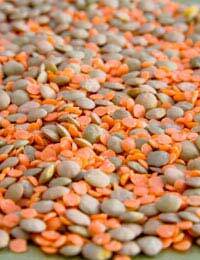 The lentils should be cooked for approximately 20 minutes, by which time they should just begin to turn tender. Once tender, remove the lentils from the pan and place under cold running water, to help refresh them. Next take a large bowl and add the herbs, lemon juice and olive oil before adding the peppers, shallots, garlic, peppers, aubergine and tomatoes, ensuring that you stir them well. Once this has been completed, take the cooked lentils and add to the mix, along with a pinch of salt and pepper. You should then leave to one side as you cook the pork and potatoes. The sweet potatoes need to be scrubbed well before being placed in the oven and baked for approximately 55 minutes. After the potatoes have been cooking for approximately 45 minutes, it is time to season the loin of pork and brush with olive oil. The loin of pork should take approximately half an hour to cook, but ensure you check on its progress in the oven during this time. When it is cooked, the meat should be tender and the juices should run clear. The next step is to take the ricotta and mix it with enough yogurt, so as it takes on the consistency of whipped cream. You than place the pork on plates and cut the sweet potatoes in half before spooning in a tablespoon of yogurt and ricotta and serving with the salad.